The Elite Properties Realty Investment division offers unique investment opportunities. The key to its success - its assets have enjoyed incredible growth by industry standards-is a keen investment eye and razor - sharp business acumen, combined with this group's strategic ability to respond quickly to market shifts and changes. In other investment groups, decisions must go through a labyrinth of decision makers who don't have an accurate read on subtle market developments. 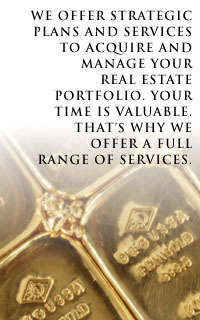 Elite Properties Realty's Investment Division can move fast and efficiently. Started 10 years ago, the Real Estate Finance Division was light years ahead of a recently emerging trend; in-house, one stop shopping for all your real estate financing needs. Comprised of an ace staff of mortgage experts, this highly respected division is known for its speedy and accurate service, quick turnaround and dedicated professionals. Because they work with a large and diverse mix of major lenders, they can find the ideal financing package to meet your unique needs. On the very cutting edge of computerization, this team is thorough and reliable. You won't find a better and more convenient way to finance or refinance your property. The Property Management Division was created because its commercial and investment clientele demanded it. Seeing a need for high quality, reliable and hassle-free property management, Elite Properties Realty created an in-house department to handle their clients' unique needs. Approaching their work with the same commitment to customer satisfaction, this successful division presently oversees a large portfolio of investments. Entrusting your property and investment to this fine team is a headache-free experience. You can't go wrong. If you have any questions, Contact Us and one of our professionals will get back to you.